In May of 2016 I conducted my very first interview related to Science Fiction and Cinema. 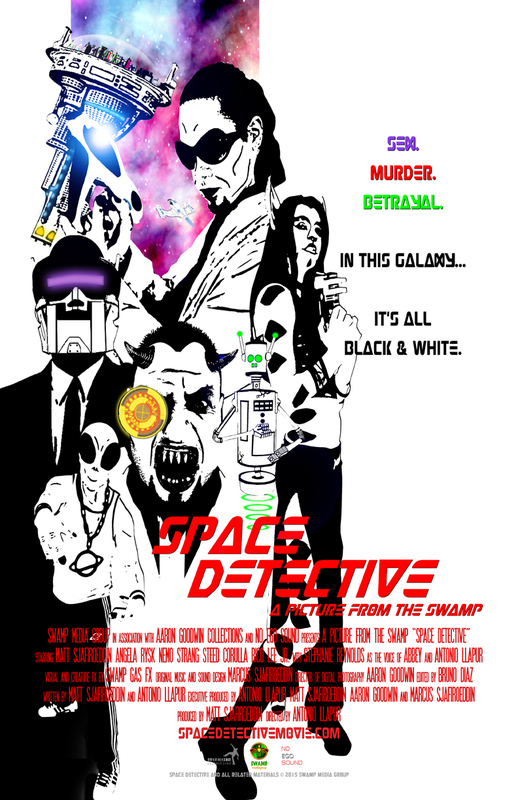 I talked with Antonio Llapur and Matt Sjafiroeddin, founders of the Swamp Media group about their upcoming independent production The Space Detective – a film created independently with no outside assistance. 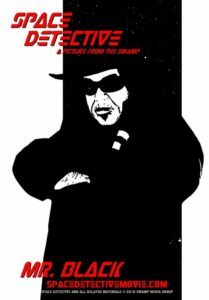 The only reason I knew about this project is because my brother Amahl Dunbar worked very closely with the Swamp Media Group to produce the film. I’m thus also one of the lucky few to have seen the movie, and I must say it is quite impressive. Part one of this interview was actually published prior to the Examiner closing down its operations, so part two was never published. At the time of the interview Antonio and Matt were finishing up production of the film, and they are currently actively submitting the film to festivals and looking for a distribution home. They’re also looking to do a local screening in 2017 in Las Vegas where the Swamp Media Group is based. The three of us had a lot of fun discussing Space Detective, the Science Fiction genre, and our favorite Heroes, Franchises and TV series growing up, so we covered a lot of ground. Enjoy. Science Fiction has long been a vehicle for entertainment – whether through books, television or cinema. The popular genre serves as an escape from real life; a vehicle to look at science and the cosmos, and a means of speculating on where science is going. It further serves as a canvas for commentary on humanity and the current social, spiritual and political issues of the times. Lastly, Science Fiction can simply be a vehicle for storytelling and a means to take part in spectacular and other world adventures. 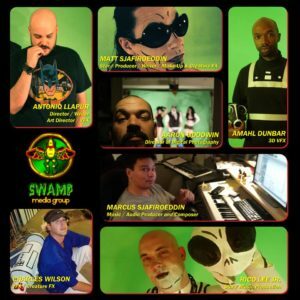 On May 2, the founders of the Swamp Media Group, Antonio “Tony” Llapur and Matt Sjafiroeddin, granted an interview to discuss their backgrounds and the upcoming release of their new independent Science Fiction movie, Space Detective. 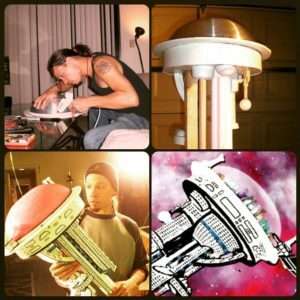 Anwar Dunbar: First, Tony and Matt, thank you for this opportunity to interview you guys and to help promote Space Detective. I write for the Examiner on literacy and in many instances Science, Technology, Engineering and Mathematics (STEM) related topics. I also volunteer at the David M. Brown Arlington Planetarium here in the Washington, DC metro area. With our full dome shows and guest speakers, we promote STEM education and we actually have a Science Fiction (Sci-Fi) weekend every year in the spring focusing on the genre. At this year’s weekend we had some guests from the Star Wars films including Storm Troopers, an Imperial Commander, and a Jawa. Sci-Fi is something I grew up with and even now as an adult, I am still consumed by it to a large degree. When I saw some of the promotional media for Space Detective, I thought the images were very compelling and that it would be exciting to talk to you both about what you’re doing and how you created the movie. So with that, let’s get started. Where are you from originally and how did you start the Swamp Media Group? Antonio Llapur: I grew up here in Las Vegas. I was born in New Jersey and we moved here when I was a little kid, when I was four or something. I met Matt in a production class at the University of Nevada-Las Vegas (UNLV). We shared a cigarette and started talking about Batman comics and have been friends ever since. Matt Sjafiroeddin: I grew up in Oklahoma and I moved to Las Vegas to go to college. I followed my brothers out here and that’s where I met Tony, at film school at the UNLV. AD: What’s the significance of the name ‘Swamp Media Group’? MS: It’s funny because we’ve been roommates for a while. We live in a house now and we used to live in an apartment. We used to call our place ‘The Swamp’. Do you remember the Television show MASH? Hawkeye and BJ used to call their tent ‘The Swamp’. So we started calling our place the Swamp as well, and it just kind of went from there. The ‘Media Group’ is our production company. We didn’t want to be called ‘Swamp Films’ because that’s just dumb, so we went with ‘Media Group’ because that involves things beyond just movies. AL: The Swamp makes a reference to MASH – whacky doctors and Media Group makes it sound kind of important I guess (laughing). AD: What are you backgrounds? It sounds like both of you have backgrounds in media, production and writing screenplays. MS: Both of us have a background in theater as actors. I was originally a theater major before I switched to film. Through film, we learned all of the processes of film making: production, editing, and screenwriting. I think we both fell in love with screenwriting. We’ve written several things together and it just kind of grew from there. AD: What in particular did you like about screenwriting? Was it the whole creative process or something else? MS: I’ve always loved stories and telling stories. My dad was a big story teller and it was good to be able to finally write my ideas down. Being able to take a class to learn the format of screenwriting really helped open the doors for me personally to be able to write stories and get things down on paper. AL: I’ve wanted to be a movie director since I was a little kid. I would see things and say, ‘Okay I would do that different and do that different’. I learned a little bit at a time. My first thing was drawing, then I learned acting, and then I learned writing and then it all coalesced into directing. I was born with a pencil in my hand so my stuff is always very visual and it compliments Matt because he’s a strong writer, and we play off each other really well. AD: So you said you were born with a pencil in your hand. Does that mean you grew up drawing and illustrating? MS: Yes we both did. We had a lot in common before we met. We both drew and we both loved movies. We both loved Batman, and we were both the weird kids in school and were thus both really connected since day one. AL: I think we were both the youngest in our families too. AD: You both have a love for Batman. What superhero or science fiction series had the biggest impact on you? Was it cartoon series like Robotech or Voltron, or was it movie franchises like Star Trek and Star Wars? AL: The earliest memory I have is going to see Star Wars at the movie theater as a little kid. Star Wars was big for me, but the Star Trek movies were what drove me growing up. I think Matt and I battled over Star Trek a lot in film school. I think we were the only two Star Trek nerds in our film school. Generally speaking, Star Trek and Star Wars were my biggest influences. MS: I’m a total Trekkie. I mean I love Star Wars, but I’m nowhere near as big a Star Wars fan as Tony. I grew up with Star Trek, and as far as Sci-Fi goes, we’re from that 80s generation so I grew up with the Transformers, G.I. 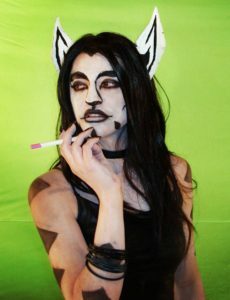 Joe, Thundercats and all of that. AL: Robotech was pretty big too. I remember Robotech being that first cartoon I saw as a kid and thinking, ‘Wow this isn’t necessarily meant for an eight year old. This is a little bit more intelligent’. In the 80s there was a lot of really good Sci-Fi, a lot of good Space Opera, and a lot of the laser gun stuff. MS: My biggest influence growing up wasn’t Sci-Fi. It was actually a comic book called Elfquest. That’s where I get a lot of my inspiration for stories and characters. I’ve been reading it since I was ten. That’s been the biggest influence for me. AL: They’re really beautiful books if you ever get the chance to read them. They’re really, really striking. MS: It’s got nothing to do with Sci-Fi though. AD: There’s a writer’s center here in Washington, DC where I’ve taken some classes myself and those two genres, Science Fiction and Fantasy, are always grouped together. AL: I read a lot of Vertigo comics in high school and college. I always gravitated towards stuff that was a little weird and a little out there. What I really loved about comics was that they always gave the chance to be out there and really do some crazy things like multi-verse and have things like clones. They it brings you back and it presents it in this silly caped form of simple morality tales – good guys and bad guys. I’m a big fan of Jack Kirby. That was a big influence on me and the look of Space Detective; the same with Frank Miller and a whole bunch of other guys like that. AD: Now before we move on, the thing I remember about Robotech was that there were a lot of mature themes in it. I think Robotech and Voltron were originally Japanese cartoons which they took and dubbed over and created different plot lines for the United States market. AL: They rewrote them for essentially American audiences. The Power Rangers, which is essentially after our generation, were originally Japanese shows that were reworked for American audiences as well. AD: We had the Voltron toys and I remember there was a Voltron II. My brother and I looked at one another and wondered where it came from because no cartoon was released for it in the United States. AL: The Voltron with the cars? AD: No, that was Voltron I. With Voltron II when you put the robots together it had multiple arms because it had-. AL: Yeah, yeah, yeah! It was the three dude robots and they stacked into each other. AD: Yes, and Voltron III was the lions. So let’s move on and talk about what you guys have been working so hard on, Space Detective. First of all, I’ve seen bits and pieces of the concept art and it looks really cool. The official trailer is pretty hot too. AD: Let me know how much detail you want to give about it because I know you probably don’t want to give the whole plot away before people see it. Talk about the concepts behind Space Detective. How did you come up the ideas for this production? MS: Well, we had just recently finished production of one of our other short films called, Joker Does Shakespeare!, which you can see on YouTube. And we were looking to do something new, another short. We were actually going to do a short for Heavy Metal Magazine which is ironic because when a lot of people see Space Detective it reminds them something they would see on that particular publication. 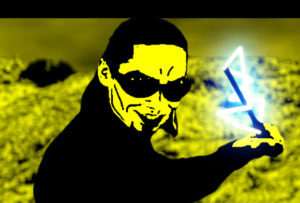 This heavy metal short was black and white and it was Sci-Fi, and the guys in it had ray guns. It was just a single guy running around in an industrial complex getting chased by cops and it was all very Noir-ish. It was very dark and there was no dialogue, just voice over. We were going to make it a short, but somewhere down the line we’re writers and we realized that we like to write so we said, “Let’s just drop this concept.” But we kept the idea of the black and white Sci-Fi Noir story, so we ran with that, and then we said, “Let’s add a little bit of color and some lasers, and some exhaust and robots.” Then it just started to blow up from there. So this ten minute short then turned into this feature length film. AL: Yes, we just kept running with it. We read our script and it was 40 pages. So we said, “Let’s just shoot it. It’s going to run about 20 minutes anyway. So we got our first cut and it went about an hour and we said, “I guess we have a feature film”. So we added to it and made it a little longer. It’s a disadvantage that it took so long, but it was also an advantage. We spent about a decade on it, but it grew a lot, so we just started shooting it and said to heck with it, we’ll just learn as we go. It just ballooned and over the years we’ve gotten a little more sophisticated and we added some things to it, enriched the universe a little bit, and went with it. It’s been a long time. MS: We’ve joked that this film has been like our graduate school education in that we’ve had to do so much of it ourselves from the writing, to the acting, to the directing, the special effects, the practical effects, the sound, the music – we had to do so much of it ourselves in this tight group of us. It felt like graduate school you know because we learned some of this stuff in college, but until you actually apply it to something, it’s all theory. So making this movie has really helped us hone our skills as film makers and storytellers. AD: Well, you know when you build something from the ground up, there is a little bit of trial and error, and figuring things out. It’s definitely not something for people with no staying power. You know, listening to you guys talk about it reminds me of the documentary, The Making of Alien, where Dan O’Bannon and Ron Shusett discuss how they came up with the ideas for the movie, and then how they had to shop it around quite a bit before Fox agreed to make the film. So when you build something from the ground up for the first time, sometimes it can take a while, but it sounds like you stuck with it and its going to bloom pretty soon. 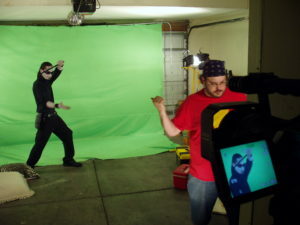 AL: When we started, we had a pretty cool little ‘short’- a proof of concept video. Around that time I was writing for a local magazine and I was covering night clubs and stuff. I wrote under the moniker ‘Digital Tony’, so I spent a lot of time in the night club industry. I knew a lot of dudes with money and I knew a lot of guys who might be willing to make the investment in a picture. No one gave us a dime. I think the most we got out of someone was a broken computer. We just said, “Screw it,” and kept shooting for a few years until we had another set of stuff to show off. We found some people who were interested in financing it, but the housing market crashed and the economy went in the toilet and no one had any money to give us. So we just said, “Okay, let’s just keep at it”. We got to point where people said, “Hey, we’d like to invest”, but we had come so far and we’re going to finish it ourselves (laughing). So we own all of it. We paid for all of it and now we have an executive producer to help us with the Post and the Film Festival. 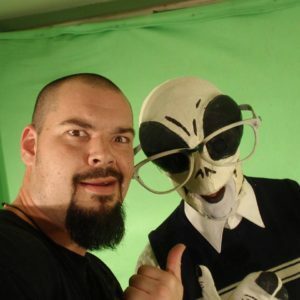 He was our cameraman, Aaron Goodwin. He’s on the show Ghost Adventures on the Travel Channel. He started off as the cameraman and has been with us a number of years and he continues to help Matt and me out. For the most part it’s been Matt, his older brother, Marcus, is handling music, Amahl Dunbar has been handling the 3-D animation, our homeboy Charlie Wilson has been our assistant animator and handling all of the lasers you saw, and myself. Our buddy Rico Lee, Jr. played Zyzzo (the villain) in the movie. He helped out with the music and all of the other cool stuff. It’s been a small team and a family affair, but it’s just us. MS: Yes, we started this so long ago that it was before Crowd Funding and Kickstarter. There wasn’t any money anywhere. Most people who try to start Indie-films today start on Kickstarter or they’ll start trying to crowd fund money. We started so long ago that it wasn’t in existence so we just did it ourselves. AD: I’ll let you guys choose how you do this, but without giving the plot-line away, in general terms, what’s Space Detective about? I’ve seen some of the footage and I’m looking at one of the promotional pieces right now and it has a kind of Blade Runner look. So are we in a Blade Runner type of thing or is it something else in terms of the main character and the story? MS: It’s funny, because people would always ask us, “What is this about?” And the title tells you. Space Detective is about a detective in space. The title is so simple. It’s like the Vermeer painting – The Girl with Pearl Earring — that’s what it’s about. We took this really straight forward conventional approach to a Noir story. It’s a very classic Noir story – this brooding detective gets hired by a femme fatale that walks through the door and hires him for a case to get her out of some ugly marriage, but then the case turns into something bigger. The visual style is very basic – it’s black and white. We took this basic approach to telling a detective story. This interview will be continued Swamp Media Group discusses release of Space Detective film part two. Follow the Swamp Media Group on Twitter or visit the Swamp Media Group website to learn more their current projects and upcoming productions. I want to thank the Swamp Media group for generously sharing the photos used in this post. If you’ve found value here and think it would benefit others, please share it and leave a comment. 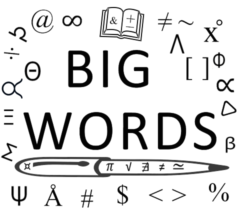 To receive all of the most up to date content from the Big Words Blog Site, subscribe using the subscription box in the right hand column in this post and throughout this site. Lastly follow me on Twitter at @BWArePowerful, on Instagram at @anwaryusef 76, and at the Big Words Blog Site Facebook page. While my main areas of focus are Education, STEM, and Financial Literacy, there are other blogs/sites I endorse which can be found on that particular page of my site. Hey Tony. Thank you for allowing me to capture all of this as you guys present this to the world. Great article Anwar! Thanks for the press! Hey Matt. No problem. As I told Tony, thank you for allowing me to cover this. I’ll be publishing part two really soon.